Despite it’s ‘Red Planet’ moniker, Mars is looking pretty frosty. The planet is experiencing an extensive build-up of frost on its north pole, the magnitude of which can be seen in the European Space Agency’s (ESA) new timelapse video. 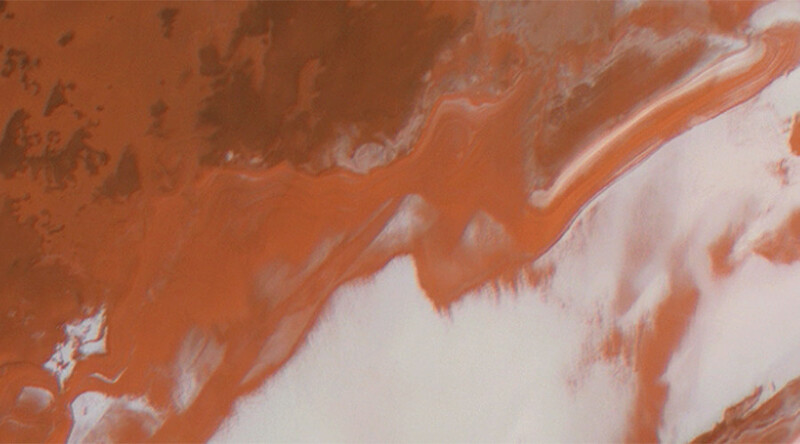 The images were taken by a high-res camera onboard the ESA’s Mars Express between November 23 and December 30, 2004. When run together, the images show the build-up of frost in a 73x41km (45x25 mile) section of the red planet’s north polar ice cap. Mars is located about 50 million miles farther away from the sun than Earth so, while it’s ‘Red Planet’ nickname may suggest a warm climate, the surface is actually comprised mostly of layers of water-ice – which can build to a depth of 2km around its north pole. During summer on Mars, a layer of carbon dioxide (which can vary in thickness from mere centimeters to a meter) melts into vapor and is released into the atmosphere, leaving behind a water-ice surface. The animated timelapse captures the subtle seasonal changes during colder months when a thin layer of solid carbon dioxide returns. ESA’s Mars Express has been orbiting Mars for the past 13 years, delivering high-resolution images and precise data of the red planet’s atmospheric composition.